The IBS 100/200 yard Group Benchrest Nationals were held from August 11-16th at the Kelbly’s range in North Lawrence, Ohio. When the dust settled, Harley Baker, IBS 2007 Group Shooter of the Year, was the big winner, taking the Two-Gun, Three-Gun, and Four-Gun overall. Mark Buettgen, Gene Bukys, and Jack Neary also shot extremely well — these three shooters all finished in the top four in the multi-gun standings. Harley Baker triumphed over a field of roughly 150 shooters including benchrest Superstars Tony Boyer, Wayne Campbell, Joe Krupa, and Bart Sauter. Bill Goad won the Light Varmint Grand Agg, while Tony Boyer won the Heavy Varmint Grand. Ryan Kelbly was the top junior shooter. Complete IBS 100/200 Nationals Match Results are posted on the IBS website. You can also download Target by Target Details as a .pdf file. 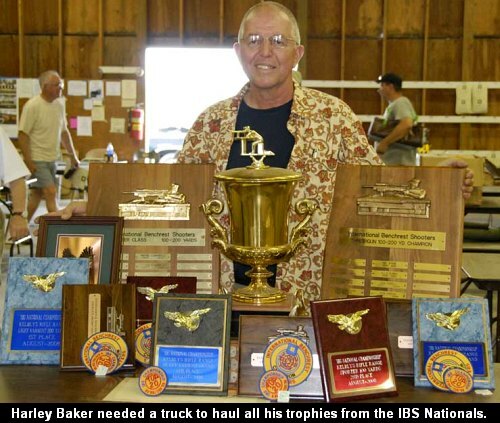 Share the post "IBS 100/200 Nationals Results — Harley Baker Wins Big"